This week was my first week interning at the hospital on the pediatrics floor, and what an experience it has been! After completing weeks of paperwork, vaccines, and more paperwork I was finally able to leave for my first day at the hospital on Monday morning and I was ecstatic! I confidently strode to my car, coffee in hand and plopped into the seat and began on my lengthy drive to Springfield. It was then that it hit me… what on earth am I thinking?! I have never broken a bone, had a surgery, or had to be in the hospital for any reason at all. I have never even been stung by a bee! How can I possibly have any understanding for what the patients are going through with absolutely no frame of reference? I stood in a small hospital room with beeping sounds coming from what seemed to be every direction. There were toys and socks on the floor, a throw blanket over the chair, and family resting nearby. There may have been machines and beeps, gowns and gloves, and a nurse’s station outside but for them, whether for a single day, or years…this room was their home. And sure enough I could look over and see Katey making music with the patient and the patient may have been playing the instruments, telling a story, or simply watching in silence. This image sat with me until it occurred to me; providing care in this context is not about understanding by one’s own history or wisdom but approaching every situation with an attitude saying “Whatever it is you need to say, I hear you” and sharing in a musical moment together. I have been excited that I feel I am finally getting into the swing of things. I am beginning to really settle into this transition from student to therapist, and I’m loving it. As this week was winding down I experienced my first complete breakdown with a client. I have seen many breakdowns in my life but for some reason this one was different, and it stuck with me. Because of this I have found myself lost in thought while I’ve been cooking, cleaning, or even trying to do homework. Doing this can feel as though I am setting aside time to stop helping others, but it is actually time to begin helping myself. When I take off my “music therapy” hat I can put on my “wife” hat, “musician” hat, or even… no hat at all! Then when I step out the door every morning with coffee in hand, I can place that music therapy hat back on my head where it belongs and head into every session with a refreshed outlook. For those of you who didn’t see last weeks post; my name is Alisabeth Hopper and I am the intern at Music Therapy Connections. I will be posting here every week throughout my internship so be sure to check in! This week was a bit out of the norm as Monday was a holiday and Thursday both of my supervisors were out of town. Thankfully, I got quite a bit of practice time leading up to a Listen & Learn for Little Ones class I was to co-lead with another therapist. I went into this experience with plenty of nerves, and much excitement. I was a bit jittery and fumbling in the first couple of songs. That is, until I was playing “Down on Grandpa’s Farm” and one young boy suggested that we sing about a fox. I couldn’t help but laugh when I had to ask him “…and what does the fox say?” The entire group, parents and children, were belly laughing at our new verse, and I felt my nervousness drift away! At times it can be difficult to set our nervousness and anxiety aside, but I have found that I am not able to be fully present in the session or class unless I do. Once I take that step I begin to experience a genuine musical moment with all of the participants. I believe that this experience is one of the things that Music Therapy brings to the table that is unique, significant, and lifelong: a connection. What we do with that connection, that’s what makes it therapy. My name is Alisabeth, I am the Music Therapy intern at Music Therapy Connections, and this is the Intern’s Corner! 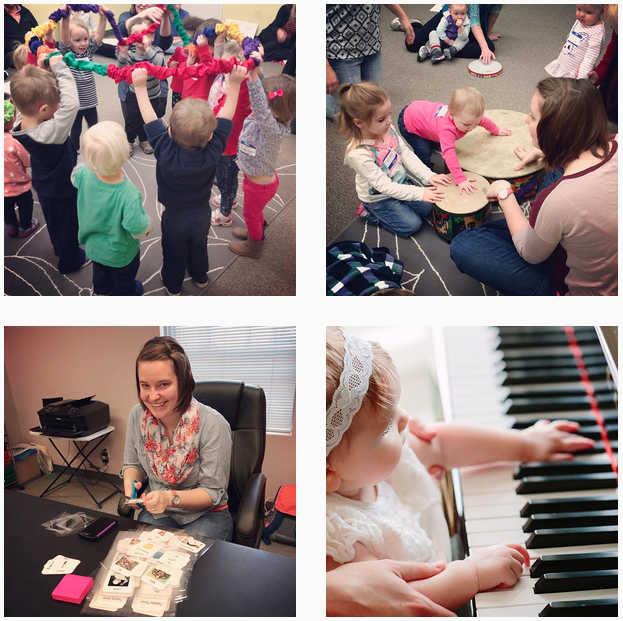 Once a week throughout my internship I will share my perspective on the internship process and what its like to intern in Music Therapy, and at Music Therapy Connections. I am so excited to share my journey with you! That being said, I just completed my first full week at Music Therapy Connections and wow, it has been a crazy week! Going into my first day I was not sure what to expect. I have known that I wanted to have a private practice ever since I began studying Music Therapy. Now I am finally here! I am able to see people actually doing that which up until now, has only been a dream. As the week went on I found myself feeling the weight of compounding stress right alongside the compounding joy that comes with doing what you love. It has been overwhelming in every sense of the word. For all of the up and coming interns out there I have made a short list of things to remember on your first week! You made it to your internship! This is an exciting time and you should take some time to celebrate the fact that you did it. You made it here. Take time everyday to reflect upon what you have experienced. Transitioning from one client contact hour per week to 20+ can be a dramatic change, so adjust accordingly and give yourself time to digest everything can be very helpful. I like to do this on my lengthy drive home. You have reached the end of the week and you are planning your to do list for the weekend; don’t forget to add some time for self care. This is time where you do something just for you. In the past this has been difficult for me, but my supervisors have made it clear that this is very important to be the best you that you can be, and after committing to it this week, I feel more relaxed and at ease. As challenging as it is to take time for yourself, when you feel overwhelmed it can be a great benefit to you. I wish you all the best of luck in your own adventures this week!